Equitorial Guinea Challenges Nigeria as Dominant Naval Power in the Gulf of Guinea. High oil reserves, increased oil wealth and the accompanying diplomatic leverage possessed by Equatorial Guinea are all reasons for Nigeria to be on the lookout for Equitorial Guinea and the serious challenges it posses to Nigeria’s security and interests. Nigeria may logically be keeping an eye for Sao Tome and Principe on its radar as well. The induction of the patrol ship “BATA” for Equitorial Guinea’s navy. The irony of interstate relations is that small States have the potential to be seen as a threat by their large neighbors. This is because it is customary for small states like Equatorial Guinea and Sao Tome and principe to rely heavily on external partnerships and support. Nigeria has first hand experience of this wit its neighbours. It is very easy to form partnerships with small states endowed with oil wealth, think Kuwait and what happened to Saddam. It is imperative for Nigeria to be wary of big powers that lie behind smaller states. Equatorial Guinea has been spending an incredible amount of money on its navy. An undisclosed number of naval patrol crafts from Israel and a Corvette from South Korea have been delivered to the oil rich tiny country in recent times. This defence build up has been canvassed in commentaries concerning the arms race being waged by Equatorial Guinea, with the country seeking to Balance Nigeria’s naval power and defend its maritime borders and Nigeria, one of Africa’s naval superpower. 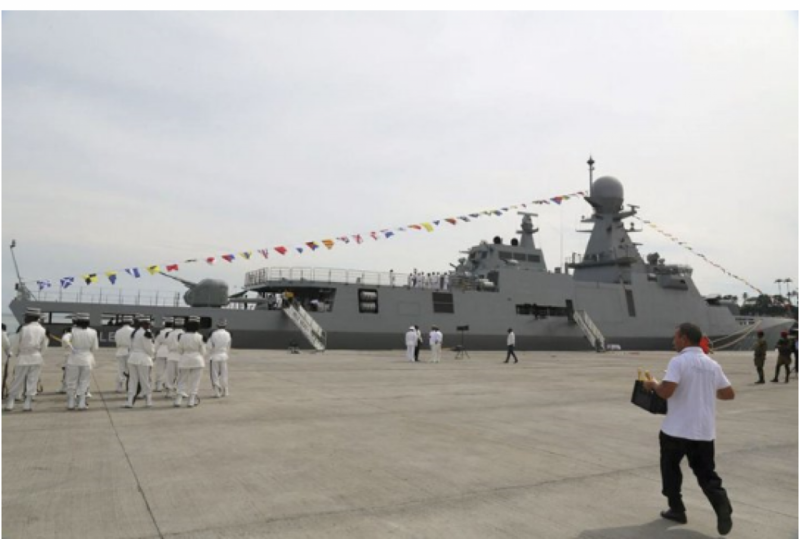 Now does the Nigerian government know its in an arm’s race for naval supremacy? Equitorial Guinea, one of Africa’s richest country with a population of just 600,000 people has built up a naval fleet larger than that of a country of 180 million people, which also happens to have Africa’s biggest economy with an oil reserve more than that of the next 51 countries in Africa combined. Now of course it will be absolutely ridiculous to premise that Equitorial Guinea can or is willing to toe to toe with Nigeria, the description however is the reality of naval rivalry between Nigeria and Equitorial Guinea. Before we proceed lemme give you some facts about Equitorial Guinea so we know what we are dealing with. Equitorial Guinea is the richest country in Africa, with the largest per capita income (at least on paper). While Nigeria has been distracted by a decade long war with Boko Haram and domestic issues, the oil rich Equitorial Guinea have been steadily building up its naval assets. To put things into perspective, Equitorial Guinea has a GDP of $15.7 billion and its defence was $8.4 billion in 2010. In 2011 Equitorial Guinea bought 3 Corvettes from South Korea plus two Israeli patrol boats. In 2012 Equitorial Guinea added the 2,500 ton frigate Bata into its fleet and ordered two more Israeli made Corvettes. As it stands Equtorial Guinea is second only to Nigeria in terms of Naval power. Nigeria accounts for %57 of the oil supply from the Gulf of Guinea, while Angola accounts for %34. While Angola is using its oil wealth as an instrument to foster its strategic interest what is Nigeria doing? Angola is making huge investments in Guinea Bissau an ECOWAS member state and is gradually carving out a lusaphone enclave. Nigeria is sleeping with a false sense of security as the regional hegemon. ECOWAS is up for the taken. The vast reserve of energy and mineral in the Gulf of Guinea is too large to be ignored by external players. The wind of conflict ahead is blowing right on our face. Militarily bases springing up along our perimeters. Morocco and Angola jostling for a foothold in West Africa, Equitorial Guinea building up the most powerful navy…all in WEST AFRICA ! Nigeria’s very own domain. The President of the Ivory Coast recently espoused that France is an important partner to the country and he is delighted to forster closer relations with Paris in other for it regain its lost glory as the economic juggernaut in West Africa. This reinforces the strong influence of France in ECOWAS region. The resurgence of an Ivorian-French partnership has the potential to reignite a geopolitical contest with Nigeria. Where is English West Africa. Why are Anglophone countries in West Africa so weak? The second most powerful country in West Africa -Ghana, which by the way has a maritime dispute with the Ivory Coast should complement Nigeria in thwarting the invasion of ECOWAS by external players jostling for influence. English speaking countries West Africa should formulate a maritime security cooperation , which should entail information sharing, joint naval patrols etc. Equitorial Guinea might have good reasons to protect its oil wealth by beefing up its navy. On January 17, 2009 Niger Delta militants stormed the Presidential palace in a bid to remove him from power. His paranoia and resolve to militarize might be understandable, however does Equitorial Guinea have wherewithal and resources to challenge a giant of 180 million people? Previous Post Previous post:How the Nigerian Military Found its Mojo Back ! !